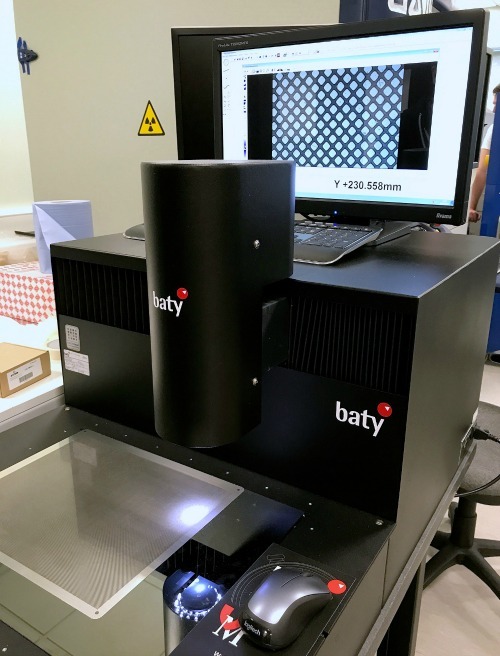 Bowers Group has supplied IBEX Innovations with a Baty VuMaster CNC Vision System to ensure the accuracy of key components used in ground breaking X-Ray detector technology. IBEX Innovations Limited (IBEX) has developed and commercialised an innovative X ray detector technology capable of generating high sensitivity materials information from standard X-ray detectors. When used in medical applications additional information such as Bone Mineral Density becomes available without further dose to the patient, enabling better diagnosis of conditions such as Osteoporosis. IBEX is also testing the technology as a way to improve the standard X-Ray techniques used in the routine screening of women for breast cancer, potentially enabling the early detection of cancer cells. The patented IBEX technology adds a precise three dimensional structure, the IBEX Multi Absorption Plate (MAP) , in front of an existing X ray detector to modulate the X ray beam in a predictable way over the area of a few pixels. It was this Multi Absorption Plate that IBEX had to ensure was highly accurate in order to facilitate the correct modulation of the X ray beam. To do this they needed a high precision measurement solution. 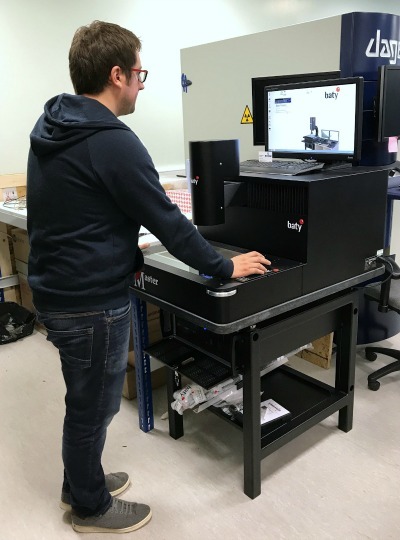 Bowers Group supplied IBEX Innovations Limited with a Baty VuMaster CNC Vision System. The Baty VuMaster CNC Vision System encompasses a floating measuring camera that moves anywhere in the measuring range. Because the camera moves and the part stays still, expensive and potentially time consuming work holding devices are not needed. Using the The VuMaster, IBEX is able to ensure the accurate measurement of the MAPs, which are thoroughly inspected to ensure all dimensions are consistent and within the required tolerances. IBEX is accredited for ISO 9001:2008, a well-known international quality standard for any business, and ISO 13485:2012, which specifically addresses work in relation to medical devices, therefore accurate measurement solutions are key to the company’s commitment to meeting high standards of quality. The VuMaster can be operated manually or programmed to carry out inspection routines that can be recorded and stored. When played back, these ‘programs’ give a fully automatic (CNC) process, recreating the same lighting conditions and using ‘Video Edge Detection’ to automatically ’capture’ feature data. The result is fast, accurate, ‘non-contact’ measurement over a large measuring range, including automatically generated reports in the form of a fully dimensioned drawing of the measured part, and more detailed tabulated data report in pdf or xls format. SPC data analysis is also included in Fusion software, these reports can be stored locally or to the company network. Founded in 2010, IBEX has developed the technology from an initial concept to fully engineered solutions, and the company is now seeing increasing commercial adoption in security, electronics, food inspection and medical markets. Once the IBEX MAP is fitted in front of an existing X ray detector, advanced software algorithms then deconstruct the effect of the MAP to determine pixel by pixel spectral content. Using the additional spectral information returned by IBEX equipped detectors, the IBEX Software Toolkit independently classifies the material type and thickness of features. By recovering spectral information normally lost in single images from indirect silicon line and area sensors, IBEX-equipped X-Ray detectors are able to effectively classify both materials and thickness changes in a sample. This enables the delivery of improved medical diagnostic imaging as well as detection of impurities, defects and threats. The IBEX Multi Absorption Plate (MAP) technology rapidly integrates into most existing detector types, and adds materials information whilst retaining the speed, signal to noise, spatial resolution and imaging area characteristics of the underlying sensors. When used in medical applications, the technology has a sensitivity equivalent to that of dedicated DEXA systems, with no compromise to the high quality diagnostic output, and no increase in patient dose. This is achieved in a single exposure, with no changes to standard clinical procedures, whilst retaining the speed, sensitivity and resolution of the underlying detector. Tests are in process at IBEX to use the technology for mammograms, lowering the risk of radiation by using half the dose, and providing contrast based on material composition which could potentially detect cancer cells.